Serving the citizenry has always has been a foundation of our government and today, rapidly advancing technological innovations are fundamentally changing citizen expectations. The last best experience that anyone has becomes the minimum expectation for the next experience. With these changing dynamics as a backdrop, organizations must begin to re-imagine how they innovate, operate, and engage with clients, employees, and stakeholders. Design thinking -- described as a human-centered approach to innovation that puts the observation and discovery of often highly-nuanced, even tacit, human needs right at the forefront of the innovation process -- is currently enjoying unprecedented attention from organizations in search of avenues for innovation, both in the public and private sector. 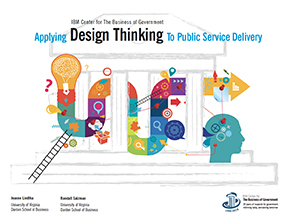 Applying Design Thinking to Public Service Delivery by Jeanne Liedtka and Randy Salzman of the University of Virginia’s Darden School of Business explores the use of design thinking in public service delivery. It focuses on the expanding use of design thinking in government to transform how agencies engage citizens, enhance operations, and innovate across a broad spectrum of public management challenges. The authors identify five core characteristics essential to most design thinking approaches. Based on extensive research and first-hand interviews, they then present four case studies from the U.S. and around the world that illustrate the purpose, intent, and success of design thinking in action. Drawing on these studies, and from conducting hands-on training and workshops of design thinking principles and tools, the authors offer recommendations to government executives who can take advantage of design thinking to drive innovation in their organizations. Download the complete report or explore more - the FIve Core Elements of Design Thinking. Read our blog about the report.